Times up! The deadline for submitting bids to buy Midway Games passed Wednesday afternoon with just one offer -- a $33-million deal from Warner Bros. to purchase most of the bankrupt Chicago company's assets. After Warner Bros. lobbed its offer in May, Midway had hoped to spark a bidding war that would jack up the price. A Chicago investment group and several game publishers had been kicking the tires at Midway, according to a source familiar with the discussions. But none pulled the trigger on a deal. "No other bids came in, so there's not going to be an auction," confirmed Midway's spokesman, Geoff Mogilner. Before the deal goes through, the Delaware court overseeing Midway's bankruptcy will have to resolve complaints by several creditors about the acquisition process. One of those is producer Larry Kasanoff's Threshold Entertainment, which produced two previous "Mortal Kombat" films and claims it has exclusive big-screen and TV rights to the series. Also objecting to the sales process is Tigon Studios, a production company controlled by Vin Diesel, which claims it is owed $200,000 for the star's work on the recently released game "Wheelman." The next court hearing to address those and other issues will be July 1. As soon as they are resolved and the bankruptcy court officially approves Warner Bros.' bid, the acquisition will close 10 days later, Mogilner said. Warner Bros. declined to comment. An acquisition would buttress Warner's growing game portfolio, according to a report today in the Times. The offer includes most, though not all, of Midway's assets, including the company's Mortal Kombat, Spy Hunter, Joust and Wheelman franchises. It also includes two of Midway's four development studios -- one in Chicago and another in Seattle. It remains unclear what will happen to the company's studio in Newcastle, U.K., which makes the Wheelman games, and its studio in San Diego, which is developing a wrestling game based on a license with TNA Entertainment. Those assets could potentially be sold to another buyer. The man who brought Mortal Kombat to the big screen has sued Midway in U.S. Bankruptcy Court over what he claims are his intellectual property interests in the franchise. The suit may interfere with a proposed $33 million sale of Midway assets to Warner Bros. In a complaint filed yesteday, Lawrence Kasanoff, through his company, Threshold Entertainment, asked the Court to preserve his IP rights including copyrights to certain MK series characters. Kasanoff also wants to retain the right to create derivative film and television projects based on the popular fighting game franchise. The Mortal Kombat series, as it stands today, is far more a creation of Threshold and Kasanoff than of Midway. Midway's creative input was almost entirely limited to the videogames. On their own, the videogames provided only minimal back-story and mythology, and only flat, "stock" characters... Kasanoff and Threshold were responsible for virtually all of the creative input that went into turning the videogame concept into a multimedia enterprise. In his lawsuit, Kasanoff also claims credit for making MK characters like Liu Kang, Sonya Blade and Scorpion into recognizable names. The suit estimates that the franchise has grossed more than $4 billion over the years. In petitioning the Bankruptcy Court, Kasanoff seeks to block the proposed sale of Mortal Kombat assets to Warner Bros.
Hopefully this will not turn into the next court chaos that blocks other franchises to get another (movie) installment for years. Ed Boon has once again confirmed that Mortal Kombat 9 will indeed contain all the gore and blood that a Mortal Kombat game deserves. He also mentioned that Carlos (Pessina) and Rick O. are currently working on some kool Fatalities for the game. Ed Boon also revealed that a familiar face from the recent past is returning for Mortal Kombat 9. The original sound composer, Dan Forden who was missing from the last few games is going to write the music for this one. Keep an eye on this Twitter accounts because more information will probably be released soon. The latest issue of our Kombat Kolumns has arrived. In Issue 04 ded_ takes a critic look at all Midway Arcade Treasures compilations that include Mortal Kombat games. Decided to list all flaws and issues, he spares no words to criticize this games. Click here to read the fourth issue of our Kombat Kulumns. See you again in two weeks. Another two weeks have passed and we are again ready to publish the next issue of our Kombat Kolumns. 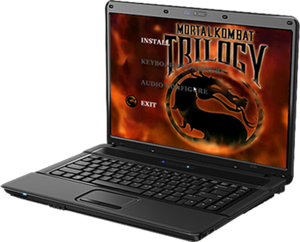 Today ded_ chose to take us back in time and review the all PC versions of Mortal Kombat that appeared on this platform throughout the years. Click here to read the third issue of our Kombat Kulumns. See you again in two weeks.